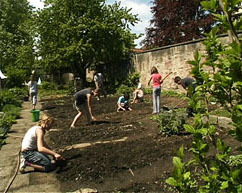 These children learn how to grow fruit and vegetables in the school garden. 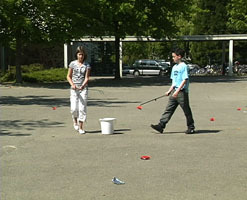 In German schools, children take it in turns to keep the playground tidy. ...and a class learning to tell the time in English. What is school like in Germany? In this section, Sophie takes us on a tour of her school in Freiburg, the Weiherhof-Realschule. Children learn the names for the different rooms and people found in school. They will see what a German school is like and can compare it to their own school. Linking with work in Art & Design, and Design Technology, children can review their own school's built environment. Weherhof-Realschule serves a residential district of Freiburg. Its pupils are aged 10 to 16; we see mainly younger classes in their first year after Grundschule (see Ch. 1.6 Ages for more about the German school system.). Would you like to make your school more individual, less like all the other schools you know? That's what some pupils thought in one school in Lutherstadt-Wittenberg, in the old East Germany. In 1990 they invited Austrian artist architect, Friedensreich Hundertwasser to transform their school, and he agreed to do it for free as his contribution to the democratic changes in the East. The result is a riot of colour and strage shapes, with hardly a straight line to be seen! How would you like to change your school, to make it feel it was really yours? In this section, we suggest you start with digital photos of your existing school buildings, then sketch your own ideas, and stick on cut-outs of what you'd like to add! 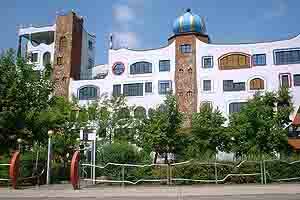 The real name of the "Hundertwasser School" is the Luther-Melanchthon-Gymnasium, in Wittenberg. Lutherstadt-Wittenberg is the town where Martin Luther lived and taught in the local university (see Ch,1,4 Famous Germans); The school is named after him. They invite tourists to visit their famous school buildings! East Germany had 500 similar modern schools all built from prefabricated concrete panels. Do you know schools like this? Zoom out out to find where it is in Germany.